Used: Very Good. "Slight wear to spine, covers and corners." 80 Quantity Available: 1. Shipped Weight: Under 1 kilogram. ISBN: 0140180907. ISBN/EAN: 9780140180909. Pictures of this item not already displayed here available upon request. Inventory No: 036250. Very Good. No Jacket. 8vo. Spine uncreased. "Now when I was a little chap I had a passion for maps. I would look for hours at South America, or Africa, or Australia, and lose myself in all the glories of exploration. At that time there were many blank spaces on the earth, and when I saw one that looked particularly inviting on a map (but they all look that) I would put my finger on it and say, 'When I grow up I will go there.' The North Pole was one of these places, I remember. Well, I haven't been there yet, and shall not try now. The glamour's off. Other places were scattered about the hemispheres. I have been in some of them, and... well, we won't talk about that. But there was one yet - the biggest, the most blank, so to speak - that I had a hankering after." Heart of Darkness is a deep, enigmatic book containing many hidden metaphors. I'm sure I didn't catch half the metaphor illustrations in the text. The entire book is a dialogue of a story being told. 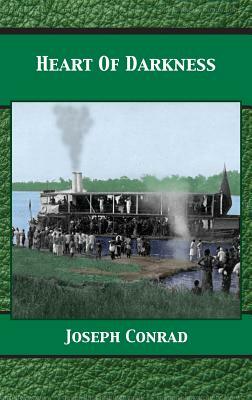 Marlow, an old sailor, is retelling the time of when he steamed through the Congo searching for the mysterious Mr. Kurtz. It might even cause a chill to go down your spine in the sincerely bleak parts. "I remembered the old doctor-'It would be interesting for science to watch the mental changes of individuals, on the spot.' I felt I was becoming scientifically interesting." It is a revelation of mankind's fatal instincts. It's about the hidden depths of the mind and the secrets inside mankind's heart. "The reaches opened before us and closed behind, as if the forest had stepped leisurely across the water to bar the way for our return. We penetrated deeper and deeper into the heart of darkness. It was very quiet there." Interesting look into Colonial practices of the English in their "out there" where young men went to make a name for themselves, sometimes in brutal ways. Coincidental (?) similarities to "Apocalypse Now " (river trip, native attack, Mr/Col. Kurtz). Enjoyed it greatly! Joseph Conrad's novella provides readers with a stunning critique of British and Belgian colonialism at the turn of the century. Conrad's vivid language and his descriptions of the "horrors" that Kurtz encounters and causes within the African Congo demonstrate the brutality and amorality of colonialism and imperialism. This book is a must-read for those interested in investigations of "otherness," Africa, and colonialism.